Kawah Putih lake is a striking crater lake and tourist spot in a volcanic crater about 50 km south of Bandungin West Java in Indonesia. 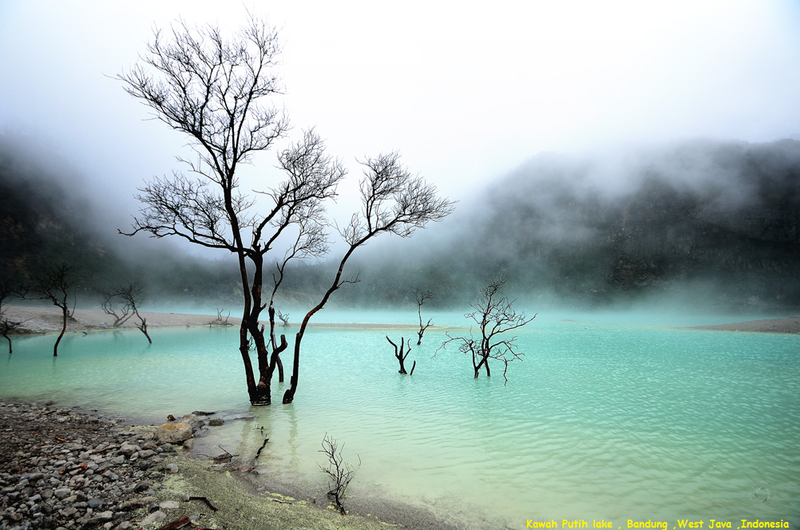 Kawah Putih lake is one of the two craters which make up Mount Patuha, an andesitic stratovolcano (a "composite" volcano). Mt Patuha is one of numerous volcanoes in Java. Kawah Putih crater lake itself represents a relatively stable volcanic system with no records of significant activity since around 1600. Kawah Putih stood out as the major crowd puller and had some of the most exotic scenery you have ever seen. Needless to say, the white crater turquoise lake was simply epic – minus the smell of sulfur – which was quite unpleasant.